Congratulations to the Penn Manor employees who earned gift cards for participating in the first round of this year’s “Take the Time to Make One Change” wellness program. “Make One Change” encourages employees to make at least one lifestyle change to enhance their mental well-being. For every five days they stick with that change, they are entered into a drawing for a $25 Weis or Giant gift card. Changes can include such things as increasing exercise or family time, reducing sugar intake, taking “brain breaks” or walks at work or journaling to help reduce or manage stress. Employees also can participate by leaving “rallying kudos” – words of appreciation or support – for their coworkers. For every five kudos someone writes, he or she is entered into the contest. For more details, employees should contact the wellness representative at their building. The second round of “Make One Change” began last week and runs through January. The Round One winners are Jerrell Birch, Dianne Smith, Melissa McMichael, Lily Williams, Karen Braun, Tammy Rote, Lisa Collins, Cindy Rhoades, Amy Adair, Wayne Shope, Patti Duff, Deb Goodhart, Chris McKnight and Dianna Lowe. 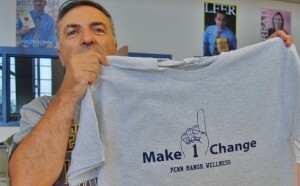 PMHS teacher Frank Dell’Estate holds a T-shirt that marked the start of the wellness program last year.